People who work for the government are a special breed. And I do not mean that in the CIA-FBI work for the government sense. I’m talking about the people you encounter at the Department of Motor Vehicles and other government offices, where you’re subjected to the greatest example of how NOT to operate a business (best case scenario), or downright incompetence and rude behavior. Granted not every government employee makes you want to put them in a choke hold or a half nelson. Translation: they aren’t all lazy, burnt out, doped up slugs sitting behind a desk with a giant stapler waiting for their next break, and taking it just as you walk up to the counter. But I think it’s safe to say we’ve all been there. Makes me spitting mad to think my tax dollars are paying those people. Well today, M.C. 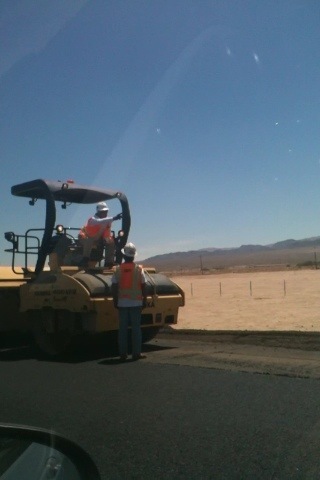 and I experienced a unique kind of frustration from the most surprising of places – the guys out sweating, digging and paving a stretch of highway in the middle of nowhere just east of Needles, California. 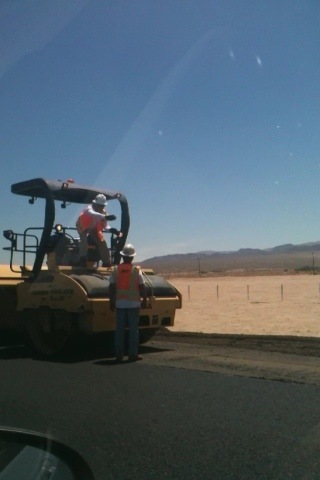 These guys were paving less than a quarter mile of one lane, which closed that lane down for three miles. That would have been fine, but you’d think they were constructing an entirely new highway. There was no one directing traffic, and they were making k-turns, backing up against traffic (sometimes encroaching on our only free lane) in their big paving equipment and other contraptions! It was pandemonium! No. It was an episode of Laurel and Hardy (look it up if you don’t know what that is…). This added an extra hour to our drive to New Mexico, all if which was spent not moving and watching these unorganized guys try to figure out how to do their job. AHHHHH….. That’s your tax dollars at work! 2 Responses to "Your tax dollars hard at work"
I hate when that happens! Funny post tho. Thanks for stopping by Chrysty! It was a mess!